As a family we spend a lot of time out of doors. Unfortunately we often track some of it inside when we get home. When we bought our house it came complete with cream coloured carpets throughout. Wear and tear and the odd muddy footprint meant that they weren’t cream for very long! 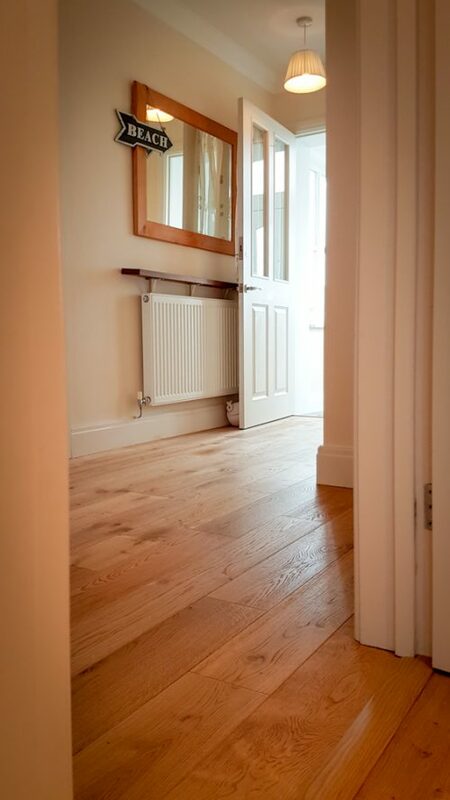 We had decided to lay a wooden floor throughout the ground floor of the house and did a lot of research into flooring types including solid wood, engineered and laminate. Our list of requirements were quite extensive we needed a floor that was easy to clean, hardwearing, warm, stylish and that would take the odd scratch or mishap without being totally spoiled. In the end we decided to go with the 150mm wide brushed and oiled engineered oak flooring from Oak Floors Online. We did this because the brushed and oiled surface naturally has the brushed texture within it which means minor scratches wouldn’t show up too easily. The engineered plywood backing means that it won’t expand or contract very much with temperature changes and it’s easy to clean and install. We ordered the 150mm boards and the Sonic Gold Excel Underlay Novostrat to help insulate the floor and cushion it, we don’t like our house to be too warm so we didn’t go for underfloor heating. 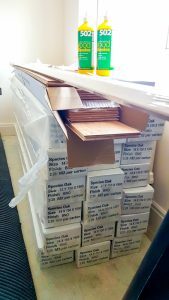 We also ordered a set of wood to wood threshold mouldings and wood to tile/carpet mouldings along with a couple of bottles of adhesive to glue the joints. Oak Floors Online delivered the flooring to us. They advised that we keep the wood in situ where it would be laid for a week prior to laying. This is so that it could acclimatise to the room temperature. We planned our installation to coincide with a short break we were taking. Our fitters were organised to come in and lay our 40 square metres of flooring while we were away. 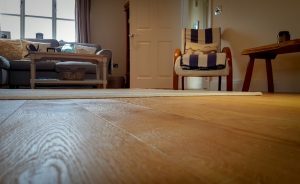 Everything went to plan and when we returned home we found new flooring perfectly fitted. It was all ready for us to walk on, no more worries about dirty cream carpets! Now that we’ve lived with the floor for a few weeks we are really happy with it. It’s easy to clean and feels warm and natural. I would certainly recommend it.